Book releases are SO much fun… all the hours and hours and hours (and hours)… (and more hours…) of endless writing, sleepless nights, wrestling with characters, editing until your eyes feel like they will shrivel up and die, all culminate into fruition because it’s done. Book is out there for people to love, laugh during, and occasional hate and throw across the room. Hopefully, that last one is rare…. Late July, seven other authors and I released a box set, Once Upon A Laugh, a set of 8 romantic comedy/Jesus-glorifyin’ novellas. We’ve been planning this novella collection ever since the release of Love at First Laugh last year, with a few authors new authors thrown in! This set contains books from Pepper Basham, Christina Coryell, Mikal Dawn, Inspy Romance’s own Heather Gray, Jessica Patch, Betsy St. Amant Haddox, and Laurie Tomlinson. And of course yours truly :-) It’s SO MUCH FUN working on romcom collections, because it naturally lends to lots of laughter and smiles. And to be along side such stellar authors was truly humbling for me! 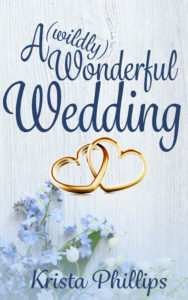 Today, I thought I’d give you a tiny sneak peek out of my own novella, A (wildly) Wonderful Wedding! 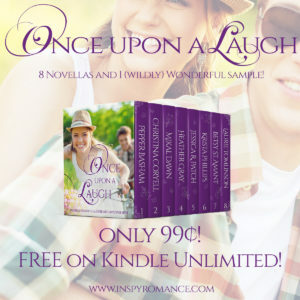 Be sure and pick up your copy of Once Upon A Laugh today, OR if you are on Kindle Unlimited, read for free!! Danielle Littleton stared at her best friend, quite a few words sitting on the tip of her tongue but none that would be helpful or welcome at the moment. There. That wasn’t mean, right? “Brandon took me out to where we had our first date and got down on one knee and everything. Look!” Mari stuck out her left hand and wiggled her fingers, her ring finger twinkling as light caught the oval rock that now graced the previously bare hand. If she wouldn’t look overdramatic, Danielle would throw her hands up right in the middle of Starbucks and shout a little “Thank you, Lord Jesus!” July was fourteen months away. Her friend had just met Brandon in March. They’d become officially a couple in April. It was now May, and they’d been dating a whoppin’ four whole weeks. Way too early to be getting engaged, and if anyone could attest to that, it was Danielle. “Gotcha.” Danni was the exact opposite. When the time came, her wedding would be big and bold and extravagant. Quick and easy hadn’t worked out for her before, so next time, it was the whole shebang or nothing. “No, see? The 14th is a Sunday, the 13th is that Saturday.” She held the phone calendar app out for Mari to see. Danni reached over and squeezed her hand. “I’m glad.” Glad that her friend hadn’t actually gone all Sound of Music on her. Danni smiled and nodded. “Of course. I wouldn’t miss it.” She’d have to practice her acting skills between now and then. Owning a business with his best friend was great most of the time. AV Design Pro had been their shared dream, and it had grown beyond their wildest imaginations. But some days, Drake wished he would have just done it by himself. Brandon was there only half of the time, the other half he spent playing drums for country music star Andrew Davies. Which meant that fifty percent of the time Drake handled everything by himself, and the other fifty percent he had his friend feeling the need to remind him to do simple things like sending a client an invoice. And now his friend was adding a wife to the mix, one he barely knew. Staring at the computer screen, he ran his hands through his hair. No. He wasn’t jealous. He’d made his choices and was happy with them. But still, there was always that wayward thought of—what if? He didn’t have to like it—but he’d be there. She flipped down the visor in her little Honda Civic and checked her makeup. She tried to use light colors to help with the happy charade she was putting on tonight. She let herself give into one last frown to reflect her true feelings, then tucked her reddish-brown hair behind her ears and smiled as bright as she could. Getting out of her car, the smell of charcoal and some type of grilled beef tempted her nose as she clicked the lock button on her key fob and straightened the purse on her shoulder. Only Mari and Brandon’s cars sat in the driveway, so she assumed she arrived before the best man. Odd that she was meeting the best friend of her best friend’s fiancé for the first time to discuss wedding details. If that didn’t scream problem, she didn’t know what did. She took the sidewalk to the front door, which opened before she even had a chance to knock. She hugged her friend back, then stepped into the cozy little bungalow. Nestled in downtown Franklin, Tennessee, a town that probably boasted more music industry residents per capita than any other city in the United States, the small house was perfect for Brandon. And, she hated to admit it, but perfect for Mari too. She could see her friend making this little house a home. Danielle tensed. What were the odds that Brandon’s best man was named Drake? Pretty stinkin’ slim, and just her luck. But whatever. She’d met a few other guys with the same name. It was just bad luck and nothing more. Squaring her shoulders, she mustered up a smile. “Congrats by the way.” Oh! That almost sounded honest! Well done, Danielle. Well done. “Thanks.” He put an arm around Mari and pulled her in snug against him. “I’m sure you’ll agree I’m the luckiest guy in the world.” He leaned down and kissed a grinning Mari. Danielle lowered her hands and focused her gaze on Brandon until he returned her stare. “You do know if you hurt my friend, I will hurt you ten times worse, right?” No acting needed there. Her defenses weakened—but only a little. Didn’t every guy say that before they got married? Brandon kissed the top of Mari’s head one more time. “I gotta get the burgers.” With that, he left out the back door, allowing a fresh wave of charcoal scented air to fill the room. Ugh. That name was going to grate on her nerves all night. “I’m on it.” Her friend disappeared down the hall, and Danielle made her way to the small galley kitchen. The room had been renovated in the not-so-distant past. White cabinets, gray-speckled granite counters, a shiny white tile backsplash, dark stainless steel appliances. It looked like a scene out of an HGTV magazine, complete with modern light pendants and everything. Danielle preferred to be a little more vintage herself. She just rented an apartment at the moment, but her dream kitchen would have dark, oak wood cabinets, a shelf—or three—dedicated to cookbooks, and a giant island for lots of prep space. Oh and she didn’t care if it looked tacky, she wanted a pan rack hanging right in the middle for easy access. She sighed. It would be years before she’d be able to afford anything close to that. No use dwelling on what couldn’t be. Flicking away the thoughts, she picked up the items Mari had laid out on the counter and, trying to balance them all, made her way back to the dining area. The front door opened behind her. Evidently this Drake-guy didn’t believe in knocking. Words caught in her throat at the sight of the familiar dark eyes, and the bowl of potato salad slipped from her hands. Read more in the Once Upon a Laugh Collection! Hi Krista! Congrats on your new release. I am enjoying the delightful selections in the Boxed set. Always amazed at the generosity of our Inspy Romance authors. 99 cents. WOW. Writing and editing is not an easy job. Thank you! I am presently reading Heather Gray’s selection. I have read the novellas Jane and chuckled through the story Crossed Out. Then your novella. Thanks again. Best wishes and happy writing. Hi Krista, congratulations- how exciting to have another book/set release:) and especially one to make us laugh. YAY! another book release, I have KU, but decided to purchase it outright, so I don’t have to give it back, lol!!! A (Wildly) Wonderful Wedding sounds like so much fun. I can’t wait to read it. Looks like some great reading! Gotta get my Kindle ready! I’m enjoying it. I had preordered it. Congratulations on release! Krista, I loved this story! It was fun and enjoyed. The whole collection was a delight to read! Congratulations on the release… what a fun-looking collection, perfect for summer reading! Good job, Krista. The excerpt sucked me right in. Congratulations, Krista! I’m reading this collection now. I’m loving it so far. Hopefully, I can get to your novella soon. Congratulations on the release! I enjoyed every one of these stories and loved the humor! I wrote a quick overall review, but will write a review for each story when they are released separately. AND I’m glad that I did NOT have to clean up all that potato salad and glass from the bowl! Fun, fun read!